James T. Lapsley, Bottled Poetry: Napa Winemaking from Prohibition to the Modern Era. University of California Press, 1996. I had the pleasure of speaking on a panel with James Lapsley at a conference at UC Davis over the summer and his wity and insightful remarks made me realize that I needed to re-read his 1996 history of wine in the Napa Valley. Lapsley is as close to a renaissance man as you are likely to meet. He’s a winemaker, historian, and wine economist who teaches in the Davis Viticulture & Enology program and runs the extension service that benefits thousands of California winegrowers by providing technical support. Bottled Poetry follows the development of the Napa Valley wine industry from the end of Prohibition to the mid-1990s, when the foundation of Napa wine today was being built. It is the sort of book that only a winemaker/historican/economist could write and so it makes fascinating reading. Lapsley weaves several themes into this history. The most interesting to me, as someone who drinks wine and studies wine markets but has never made wine, is the story of the low quality of most California wine was in the early post-Prohibition years and what a struggle is has been to reach the high quality standards that we take for granted today. I am especially impressed with the role of science and technology has played in rise of wine quality. It is easy to think of technology as the enemy of terroir and I suppose sometimes it is, but much of the improvement of wine in recent years is due to improved technology and winemaking practices. White wines in the 1930s and 1940s, for example, we stored in huge redwood vats for several years before release. Fermentations were naturally hot and the use of sulfites was quite haphazard. Quality suffered. Bottled poetry? Lapsley doesn’t make it sound like many of these wines had much poetry left in them by the time they hit the marketplace. 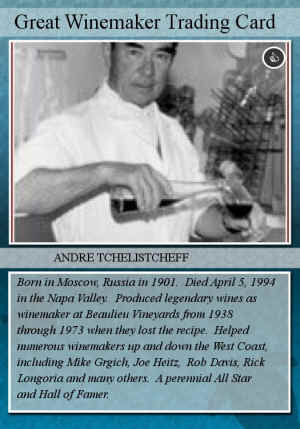 Many prominent Napa figures were instrumental in developing technical improvements, Andre Tchelistcheff and the Mondavi brothers among them. All the wines benefited from these innovative efforts but the improvement in white wines is especially noteworthy. A second theme is the influence of large corporations and although Lapsley tells the story in an even-handed way, it’s clear that big money often had a corrosive effect. Several of Napa’s historic wineries were absorbed into corporate portfolios where their powerful brands were exploited even as the quality of the wines was debased. Commercial winemaking is a delicate art. It devours capital like a hungry shark, as Lapsley notes, so deep pockets are useful and corporate funding tempting. But the profits comes only in the long run, which does not always suit the needs of businesses that must produce positive quarterly earnings reports. Corporate ownership isn’t necessarily the kiss of death for fine wine, but the the history of Napa is filled with enough negative cases to make anyone a skeptic. A final theme is the fundamental challenge of balancing supply and demand and this is a problem that continues today. Lapsley’s book ends on an upbeat note that I think is still appropriate 14 years after its publication. Napa Valley has grown and changed, that’s for sure, and although its problems have not disappeared its promise continues to be realized. All in all, Bottled Poetry is a great read and a terrific addition to the wine economics history bookshelf that also includes volumes like Thomas Pinney’s A History of Wine in America. I understand that Jim Lapsley is working on another history project — the 19th century roots of the California wine industry. Can’t wait to read it!